Two of John Pizzarelli’s greatest influences, Frank Sinatra and the bossa nova composer Antonio Carlos Jobim, joined forces in 1967 to present a softer, sultrier side of Sinatra on the heels of “That’s Life” and “Strangers in the Night.” Half a century later, John Pizzarelli is celebrating that unique gathering and pays tribute to those original recordings. 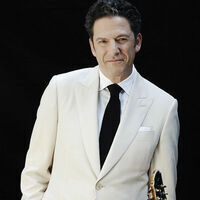 John Pizzarelli has been entertaining audiences for over 20 years, singing classic standards and late-night ballads, and by playing sublime and inventive guitar. Using greats like Nat “King” Cole and Frank Sinatra (for whom he opened in 1993) as touchstones, Pizzarelli brings a cool jazz flavor to the Great American Songbook. Pizzarelli has collaborated with an array of artists, including James Taylor, Natalie Cole, Rickie Lee Jones, Rosemary Clooney, and, of course, his father, the legendary jazz guitarist Bucky Pizzarelli. With his charm, humor and rollicking swing jazz showmanship, Pizzarelli is setting the standard for stylish modern jazz. Gold Seats: $175, includes private Gold Bar Intermission before the show with complimentary beverages, plus a post-performance reception with John Pizzarelli.